The Forest: 1-10 Starting Region. The Forest is a region of Appalachia characterized by lush forests, winding rivers and diverse wildlife, as a result of having not been hit directly in the Great War. The area is home to pre-War towns including Charleston and Point Pleasant, as well as landmarks such as Landview Lighthouse and the Whitespring Resort. It is also the first region the Residents explore after emerging from Vault 76. The Toxic Valley: 10+ Before the Great War, the region contained a number of factories and industrial sites. After the bombs fell, chemicals discharged from the factories cloaked the area with white powder. 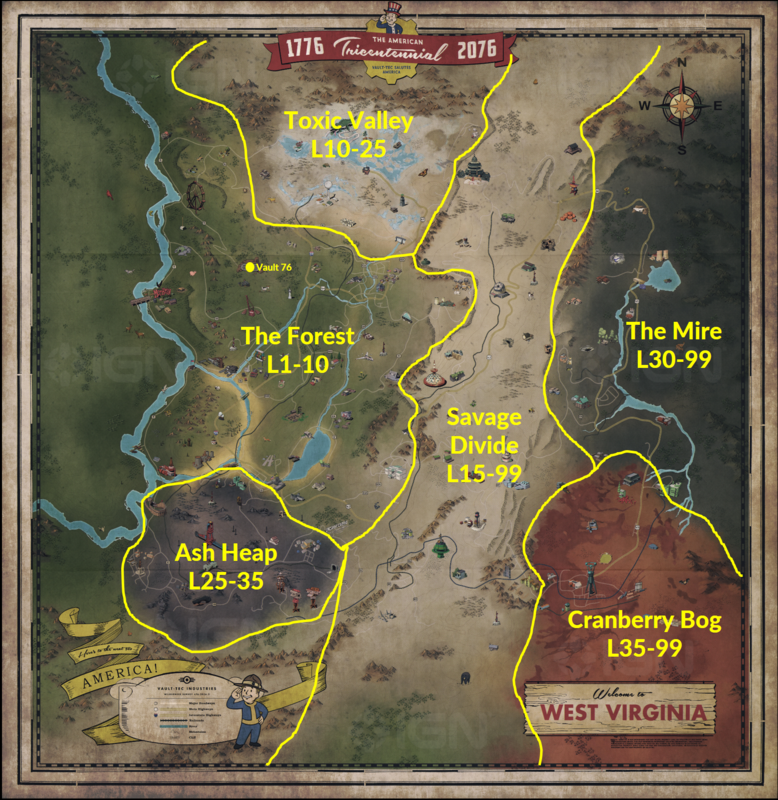 The Savage Divide: 15+ The name given to the region comes from the tall mountains creating a large wall between the regions of the Forest, Ash Heap and Toxic Valley on the west side, and the regions of the Mire and Cranberry Bog on the east side. The Ash Heap: 25+ The Ash Heap was formerly home to industrial sites such as mines and a trainyard that primarily revolved around mineral extraction. The area centers around the excavated mining site of Mount Blair, and can be identified by the layer of soot and ash from unchecked coal mine fires covering the region. The Mire: Level 30 and up. The Cranberry Bog: Level 35 + for this one.